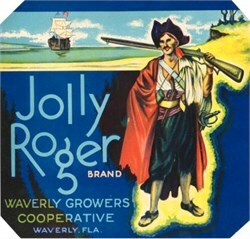 Beautiful authentic lithograph of the Jolly Roger Brand of Fruit from the Waverly Growers Cooperative of Florida. The image shows a pirate with his ship in the background. This item was printed in the 1920's and is approximately 8 1/2" x 8 1/2".